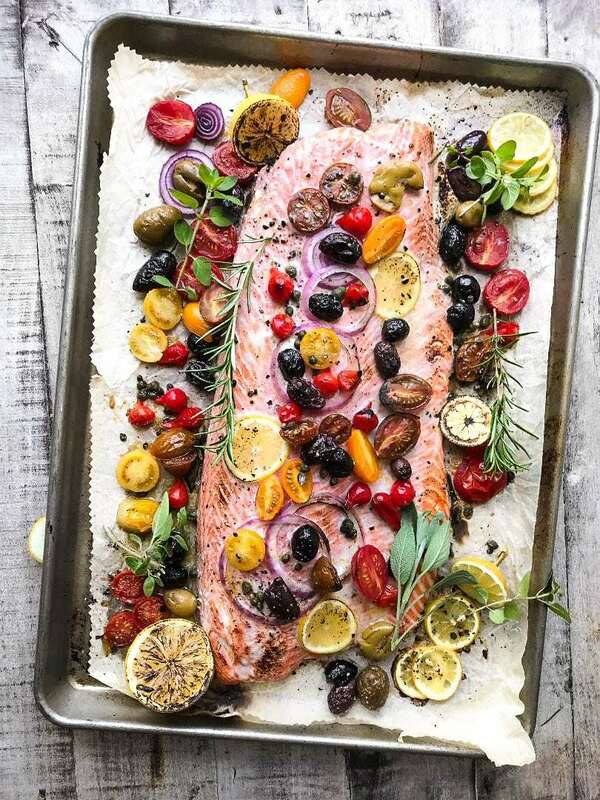 Mediterranean Sheet Pan Salmon ~ this quick and easy 30 minute meal is beautiful, delicious, heart healthy, gluten free, low carb, low calorie, paleo, and whole 30 friendly. You can't afford not to try it! Line baking sheet with parchment paper and lay out your fish. Tuck the thin tail end under to make a thicker layer so the fish will cook evenly. Arrange the lemon slices on and around the fish, along with the olives, tomatoes, peppers, capers, and onions. Drizzle olive oil over all, and sprinkle with salt and pepper. Dot with chunks of butter, if using. Bake for about 20-30 minutes, or until the fish is done through and flakes easily with a fork. The exact cooking time will depend on the size and thickness of your fish, and if your fish is especially thick, or heavier, it will take longer. Garnish with fresh herbs before serving.